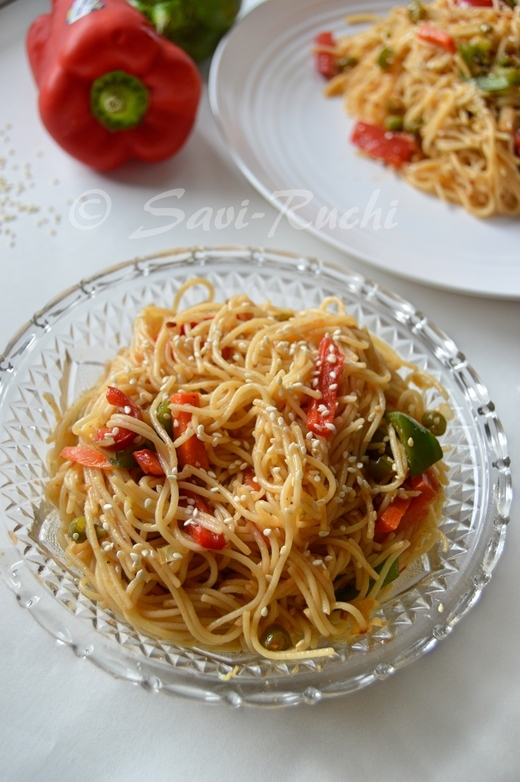 Savi-Ruchi: Baby corn-capsicum grilled sandwich in Mumbai style. Baby corn-capsicum grilled sandwich in Mumbai style. Who doesn't want to whip a quick brunch on weekends? I obviously do especially when we get up very hungry at noon :D Most of us relax & enjoy our weekend. Some families cook elaborate meals on weekend as they feel, they would have rushed to make weekday food. However some families believe in relaxing & enjoying with the family, rather than spending most of the weekend time in the kitchen. I belong to the latter. I keep weekend cooking as fast as possible. Hence would come up with different sandwiches, burgers, poha, upma etc. This is one such sandwich tried. I love the combination of corn & capsicum. That is already evident in my previous posts, isn't it? Crunchiness & tad sweetness of the half cooked baby corn with a spicy chutney & a bite into the capsicum makes this sandwich delicious. Sandwich bread: 6 slices (It could be white bread, whole wheat or multi grain). Capsicum: 1 no (seeded & cut into small pieces). Green chutney: 1.5 tsp for each sandwich. For green chutney: (The below ingredients will make approximately 1.5 cups of green chutney). Green chilies: 6-8 nos, more or less. Wash the mint & coriander leaves thoroughly in water. Chop them coarsely. 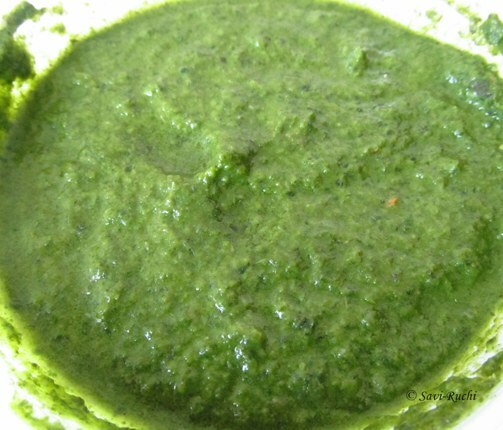 In a food processor, blend all the ingredients mentioned for the green chutney to a smooth paste. Add little water, if needed. Scoop out the chutney to a air tight container, store it & use as needed. The shelf life of chutney is around a month. Remove the crust of your bread. (Optional). Evenly spread a teaspoon or more of the green chutney on the bread slice. Throw in the slices of the baby corn on top of the chutney. Isn't attractive? I loved the green & yellow combination here. Sprinkle the grated broccoli. (around a tbsp). Throw in the finely chopped capsicum (around a tbsp). Cover with another slice of bread. * I have grilled the sandwich on a electric griller & also on a stove-top griddle. I prefer to grill them on a electric griller. The slow cooking in the electric griller makes it tasty. However, not having a griller should not be a reason for not trying. Go ahead & make it on a tawa/griddle. While using a griddle, ensure to cook the sandwich on a low heat. Cook on both sides until golden brown. Baby corn-paneer is also a very good combination to try out. The green chutney recipe mentioned here is very versatile.It could be used as a dip for fritters, french fries, pakoras, kebabs, samosas etc. The same chutney along with sweet chutney could be used for making chats, like bhel puri. So, making them in bulk is no harm. Spicy & inviting sandwich...Love it. yumm..you are really making me hungry now..
Wow,my kid would love this,he has a great love for baby corn,a must try,lovely pics! Hurray !Easy & Best method. tempting and yummy sandwich....love the flavors!! Yum yum...love those grill marks crisp and tasty..
Baby corn flowers look super cute..I love this sandwich!! I love your sandwich recipes. I am your regular reader from Singapore. Would love to meet you since you too are here. But need a clarification, ppl say cutting onion before a day and using it is hazardous to health. In this recipe you have used onion in green chutney and u hav said we can keep it for a month long. How is this possible? I do not know if it is hazardous or not. You could use peanuts instead of onions. Let me look in the internet about the ill effects of storing the onions. Thanks for informing me about it.